Movement is the impossibility, indefiniteness and imperfection of every politics. It always leaves a residue. In this perspective the motto I cited as a rule for myself might be reformulated in ontological terms as this: ‘the movement is that which if it is, is as if it wasn’t, it lacks itself; and if it isn’t, is as if it was, it exceeds itself’. It is the threshold of indeterminacy between an excess and a deficiency that marks the limit of every politics in its constitutive imperfection. Let us not sulk for our pleasure! The movement against the labour law of the spring of 2016, the defense of the ZAD of NDDL [Notre-dame-des-landes] in the spring of 2018 and finally the movement of the yellow vests that appeared in autumn 2018 and which continues: the spirit of the time is rebellion, each time in unprecedented forms. At the head of demonstrations [le cortège de tête] in the first case, the defense of a rural territory communised in the second, and finally the blockages and uncontrolled demonstrations in the last. An unknown territory, although familiar, has just acquired a political existence. 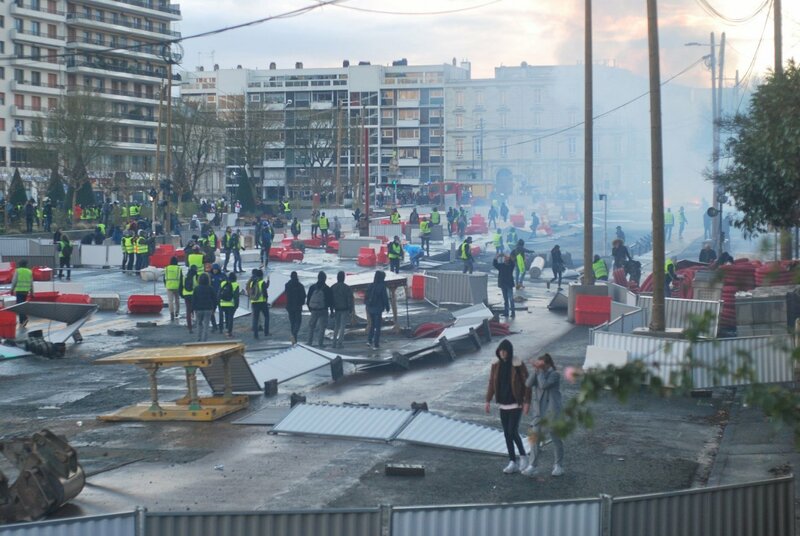 The yellow vests have in effect invested a peripheral space made of up non-places, roundabouts, motorway tolls, shopping center parkings, on these roads that serve to organise and distribute atomised functions to which the neo-urban are assigned. This day-to-day environment of millions of traffic jams in the early morning and late afternoon seemed to have neutralized any possibility of an event. Statistics say that half of the French population resides in this periphery. But all these people remained desperately invisible … they had to put on a yellow vest to exist, like others had to put on a balaclava or a black k-way jacket … The fact that the Adama Traoré committee quickly called to join the gatherings of yellow vests in Paris is exemplary, Beaumont-sur-Oise, the border point between the Parisian suburbs and what was once the french countryside, embodies precisely this periphery of the metropolis which has taken on a political existence (in this case since murder of Adama Traore) and it does not intend to give it up. To use a term that is not innocent, one can say that it is an essentially provincial movement, and in this, it is completely new. Demonstrations and riots break out in small towns where nothing ever happened – the very ones where the State decrees the closing of train stations, post offices, schools, maternity hospitals, why spend the public money for the anonymous of the suburbs? Yellow vests rise up everywhere. A riot in Nantes, St Nazaire, Caen, Rouen, still has nothing improbable … But in Beauvais, Bar-le-Duc, Narbonne, Le Puy, Angers, surprise! We know that, in their vast majority, the rioters who ransacked the beautiful Parisian neighborhoods on December 1st and 8th came from the said province. Their wandering in Paris was more a matter of moving hooligans into enemy territory than of the traditional union procession. The contempt of the provincials, displayed by this capital, where the elites of the nation sit, finds its answer here. It has already been said that Paris, now almost entirely pacified and gentrified, could no longer be delivered over to ransacking and vandalism. Never before has this been denied in such exemplary fashion. The province is a typically French notion. In this common language, which expresses the hierarchical organization of the nation, one goes up to Paris and goes down to the provinces. At the top of the pyramid thrones the capital, whose lights radiate throughout the hexagon. Generally speaking, in the current configuration of capitalism, the relation of the periphery and the center unfolds in a more rectilinear than concentric way. However, in nation-states as centralised and centralist as France, the circulation networks inevitably overlap with a concentric organization of the territory that remains decisive. While going up to Paris to terrorise the bourgeois of the 8° [district or borough], the yellow vests reversed the pyramid. The peripheral character of the movement is not only geographical and political. Another centrality is questioned, that of the factory which has for so long constituted the axis around which movements revolved. Here it is no longer the company which constitutes the initial place of aggregation. The people who find themselves on the road blockages did not usually know each other before, their complicity was established from a voluntary act that can be described as political. Hence the disarray of the labour unions in the face of this movement, which were also eager to sign a non-aggression agreement with the Macronie from the beginning of December (only Solidaires and some sections of the CGT refused this declared act of collaboration). In relation to this, we can measure the exhaustion of the union form, already perceptible in the spring of 2016. The Marxian analysis postulated that the genesis of exchange value was in the production, the circulation of the commodity only realising the value. But in this dynamic that is capitalism, all the moments are dependent and have reality only in relation to the totality that they thus form. Firstly because circulation adds value to products and generates profit, (in the sense that a whole industry develops that ensures this circulation, made up of banking, insurance, marketing, transportation, storage, large distribution, not to mention the activities induced …) (1) to the point where it becomes difficult even to separate the two moments. This is obvious for products such as energy, for example, the production of a nuclear power plant is inconceivable without the high voltage lines that will distribute electricity, the same for an oil refinery with its networks of stocks and service stations. Similarly, textile made in China can only be produced in function of giant container ships that will transport the precious t-shirts to Western ports – and no one can claim that shipping does not create value. In the extreme, the internet embodies the pure circulation of value, rendered almost independent of the exploitation of living labor -though it was necessary for the electronic and computer tools that ensure it to have been manufactured in a factory. It thus becomes problematic to isolate a segment of activity that would be production in relation to the totality of the labour and the exchanges that make up what is called society. The Italian comrades of the 70’s already spoke about the factory-society – which is an oxymoron frankly assumed, a factory not being a society but a system. To speak of the global factory seems to us adequate at this moment when the capitalist enterprise grasps and reconfigures all that exists in the mode of the manufacturing plant, of the factory. A hub, whether maritime, airport or road, a commercial area, and even a highway are so many of the wheels of this global factory. The distinction between the private sphere and the public domain, which since the French Revolution defined the relations between civil society and the State, then fades under the influence of apparatuses that are the real power organizing the movement of individuals. In the global factory, the company loses all density while the State is no more than a service provider. The fact that the centrality of the factory in struggles has now passed leads us to formulate the hypothesis that the next insurrections will seize companies from the outside, and not the opposite (formulated in Marxian terms, they will begin with circulation to then seize production). In sum, like the GJ [Gilets Jaunes] movement that starts from the periphery to invest the center. No longer though with the perspective of self-management, where the workers seize the factory, but in the opposite direction: powers coming from outside, constituted in rupture with the logic of the global factory, would seize the factory to transform or dismantle it according to their own necessities. We are obviously not there yet, but the proliferation of revolts in the periphery, since those of the suburbs in 2005 to the current GL movement, indicates that a new cycle is starting, very different from the previous one and which has not finished surprising us. Today’s atomised workers, unlike the mass workers of the Fordist era, no longer have room to maneuver on wages, which stagnates while everything increases, and therefore find themselves fighting against the tax burden on their revenue. On the left, some suggest that in doing so they take up this classic theme of liberal ideology of lowering taxes, and this is true of some yellow vests, small bosses and traders. But the majority is well aware that in this case if tax cuts there have been, they were applied exclusively to very high incomes, above all by means of the elimination of the ISF [Impôt de solidarité sur la fortune/Solidarity tax on wealth]. Furthermore, if the question of wages arises from within a company, the tax question arises in relation to the State: it therefore takes on a directly political resonance (knowing in addition how much fuel taxes fuel the State budget …). (4) From this point of view, the fact of making the motorways free and smashing the radars shows that this racket is perceived more and more like a rent situation worthy of the Ancien Régime. Except that this time it is not tax collectors who gorge on the backs of people, but the state and companies like Vinci who manage the motorways … Moreover, it can not escape anyone that in recent weeks, many yellow vests moved onto more social rather than fiscal demands (minimum wage increase in particular), even if the return of the ISF is still at the top of the list. In a month and a half, the yellow vests will have succeeded what the labour unions have been unable to do during the past two decades. Unorganised within the trade union framework, the yellow vests were not trapped by its institutionalized modes of action or abused by subsidized bureaucrats. Which also allowed beautiful riots in this Paris where the provincial proletarians flocked … (and even if some of the yellow vests do not assume this vandalism, their mere presence made it possible … and there, there were no union marshals to break the enthusiasm). Wandering thus tends to replace the classical demonstration. While taking the lead in a march [le cortège de tête] was still dependent on union protests and found its limits on May 1, 2018 (the head of the march was as important as the trade union in numbers, with a huge black block, and all this for an insignificant result). Freed from any concept of a march or procession, the crowd drifts! Union marches travel down the central avenues, a place of representation par excellence, in a disciplined and disciplinary way. While the wanderings of the yellow vests in Paris in November and December 2018 were characterized from the outset by a scattering and freedom of movement. It seems, however, that this is showing signs of rot; since mid-December in Paris, the protest trajectories are registered in the prefecture of the police and the march of the 12th January saw the appearance of a marshals, on the union model – who appointed them? It is not fortuitous that they appear precisely at the moment when representatives begin to try to take control … In provincial towns, however, the yellow vests have maintained their joyously uncontrollable wanderings, or, as was said above, it is in the provinces where most of the movement is played out. In Marseilles, on January 12th, the wandering of the yellow vests drove those responsible for the repression completely mad, for they had to follow a totally unexpected zigzag journey, even taking a motorway tunnel and leaving the robocops out of breath. The camps constitute themselves as the basic form of the communication, from Occupy Oakland to Taksim Square, from the camps on the zocalo of Oaxaca to the camps of the Lakota Range, from the ZAD to the strongholds of Val Susa. The construction of space comes first as a political affirmation. While the protest demonstration remains indifferent to the space it crosses, the occupation involves the production of a commons which reconfigures the place. In this, the blockages of the yellow vests are at the antipodes of Nuit Debout: whereas these gatherings invested only central places, obeying the hierarchical injunction which orders the urban and suburban space, and gave primacy to speech, the GJ blockages are almost always in peripheral zones or on major traffic arteries and give primacy to the very action of blocking and to the relations that it establishes between the participants. This is the great innovation of this movement. In addition, if the organizers of Nuit Debout negotiated with the police prefecture the possibility of remaining on the spot, the majority of blockages are imposed in fact without asking for anything. One demand is unanimous with all of the yellow vests, “Macron resign”. This country, though it has guillotined its king, is still, two centuries after, the most monarchical of Europe – and thus this typically sans-culotte fury which animates the yellow vests. (7) But the monarch is no longer invested with the sacred character he had under the Ancien Régime: the French elect one, and then hate him after a few months. The monarch of today is a product, quickly obsolete like everything that is produced nowadays. After Sarkozy the cocaine addicted caricature, then Holland the manic-depressive, and now the strapping male, launched to put a spectacular end to the bipartisan regime prevalent until then under the V Republic. The fact that he had never been elected before designated him as the appropriate person to do so: while the political class, composed of mayors, presidents of general and regional councils, deputies and senators, is still stuck in relations of dependence, the Macronie frees the government from such a weight. From now on, the state coldly asserts that it is only a service provider of capital. More negotiated arrangements, but pure injunction: in this, Macronian governance devotes itself to the replacement of civil society by the global factory. The presidential arrogance, that goes as far as insult (these bastards of the poor! ), reproduces the processes used in modern companies, themselves inspired by the training and drilling techniques used in the special units of the army. One of the most interesting texts published on this movement evokes a “tragedy of the middle class” which has to do with the relation to money. (10) “The preoccupation with money is permanent, and all the more so when one finally has access to it. One is of the middle class when one earns enough money to, consciously or not, directly or not, to think only about it. (…) There may be no social position where we can know better what money is.” One could add: if for the most destitute money is only a necessity, while for the rich money is the very expression of freedom, for the majority of workers the relation to money is constantly torn between these two extremes – in this, there would exist an effectively middle-average class! It is the very principle of spectacle capitalism to constantly mirror this freedom – that of for example to be able to move in one’s own car … That this spectacular freedom is made possible by a daily slavery, this is the experience that everyone has in an intimate way, without ever being able to express it. Which makes people sick, literally. And one must never neglect the fact that the therapeutic side of revolt is what also gives it political power. The Macronie, which, in order to have nothing concrete to let go of, is disposed to give ground on the level of representation, thereby offering a perch to all those more or less under the influence of the lucubrations of [Etienne] Chouard [a yellow vest “leader” and defender of the citizens’ initiative referendum]. As Rafik Chekat says, “The problem of the citizens’ initiative referendum (RIC) is that it perpetuates the tyranny of the majority. Why would the majority always be right? Without playing soft, belonging to a minority group makes you suspicious vis-à-vis majorities because you know for a fact that in some cases they can look like groups of lynchers. Can you imagine a #RIC right after #charlie? That this demand for the RIC is carried by whites is not a fortuitous thing. But beyond the racial question, what does it mean to be a majority at the time of #BFMTV, # TF1, [french television channels] #Hanouna, [french television presenter] the consumer society, etc.? The problem of the RIC is basically that of the vote, this mechanism that organises at regular intervals our impotence. We can try to shorten these intervals, to vote more often, it will not change anything. If it is necessary to speak in terms of subjectivation, the vote creates a particular type of individual through a mutilated relationship to existence, and more particularly to politics, to public affairs.” Especially since it is difficult to imagine the government holding a referendum on reintroducing the ISF or not (2/3 of French who would be favorable, according to a survey). The regime struggles to find interlocutors, it is obliged to go fishing on Facebook. Most of the self-proclaimed leaders, and almost immediately disavowed by the yellow vests, are carefully staged on television and the media systematically co-opts characters with dubious affinities – which also allows the right-thinking Leftists to bounce back in their condemnation of the movement. Never before has the media appeared so visibly for what they are: one of the two pillars of the regime, with the police. It is, for them, a matter of trivialising the idea that, outside of this regime, there is only the extreme right – which we also know how much it is favoured among the ranks of the police. It was already on the grounds of this lie that Macron managed to win the presidential elections, and the president-elected-to-block-the FN has just launched a new gadget, a “Great Debate”, where the first issue addressed would be … that of immigration! The importance taken on by so-called social networks in this case is far from anecdotal. In the periphery, the network socializes. But all those people who ended up in a yellow vest from a Facebook call created an experience that is anything but virtual. The question now is whether the yellow vests have rejected the political class to inaugurate a kind of virtual democracy, where a like would replace the ballot, or if, as those from Commercy explicitly propose, to organise in assemblies of a new type. Because the network only socializes in a closed circuit, generating the inter-self and where the charisma of some “whistle-blowers” is free to express itself, to capture intensities. A more fragmented form of media manipulation than that of the mainstream media could then function as a technique of governance. A Tunisian friend who took part in the 2011 insurrection spoke of the rapid mobilisation capacity that the insurgents had had with social networks in the early days, but also the fact that the police quickly understood the interest and had not failed to intervene to spread false news and misinformation … The amount of false debate circulating on these networks in France is undoubtedly the same. The articulation of the roundabout and general assemblies now arises, after two months of agitation. On the one hand, the ties of proximity and complicity woven on the ground, that allow taking action without having to deliberate – and we know how much the deliberations in assembly can be demobilising when it comes to direct action – but which can only be exercised at the local level; on the other hand, directly connected assemblies that could act as a place for strategic thinking and tactical coordination. In contrast to this perspective, the yellow vests could give birth to a demagogic movement, like the 5 Stelle in Italy. A faction would probably be tempted to follow this path, even if it means cutting itself off from the rest of the movement. It must be remembered, however, that 5 Stelle was fully produced – even though it surfed on the short lived Forconi [Pitch fork] movement. In the current state of things, the GJ would lack the media clown essential to attract the attention of crowds, in this case the figure of Beppe Grillo, a public entertainer put in the saddle by some businessmen – the Berlusconi intermezzo was used up, it was urgent to launch a new product. Italy has gone from decades of secret government (P2, Andreotti, the strategy of tension and alliances with the mafia) to picture-tube government (Mani Pulite [Clean Hands], Berlusconi and Beppe Grillo). The problem with this mode of government is that it is necessary to renew the characters who embody it as frequently as the show biz must renew the stars it produces. At a time when post-Fordist capitalism owes its survival to the rise of fictitious capital and now operates in the open, the denunciation of the excesses of finance – which leaves aside the essential, namely the criticism of value, of money and merchandise – encourages all manner of miracle solutions and demagogues. One remembers the well-worn gag of the Tobin tax, for example, or the candidate Hollande: “My enemy is finance” (this one was hilarious!) When almost all workers work to pay their loans (especially for the automobile …), it is normal that the banks are designated as a prime target, in words as in vandalism (special dedication to GJ of Toulouse who ransacked several banks last Saturday). But there is reason to be wary when, in addition, reference is made to the Rothschild bank, rather than to BNP-Paribas or Société Générale (whose rescue by the State after 2008 will finally cost the taxpayers 30 billion euros …). The fact that Macron started his career precisely in this bank obviously excites the anti-capitalism of fools who point to “Jewish finance” on social networks. This movement, obeying no vertical and centralised direction, allows local initiatives to multiply. But these can diverge completely from one place to another. After two months of agitation, the moment is approaching a decision. A party, in the historical sense of the term, proves itself as the victorious party by the fact that it splits into two parties in turn: it thus proves that it contains in itself the principle that it previously fought against outside, and thereby eliminates the one-sidedness with which he had entered the scene. The opposing elements that coexist within the movement have until now been held together by a common hostility to the regime in place. Proponents of an institutional outcome – which would obviously be authoritarian and xenophobic – would then oppose supporters of a broadening of the movement to all aspects of the global fabric from a revolutionary perspective. In fact, actions are multiplying around struggling companies where yellow vests are joining red vests on picket lines. It is not forbidden to think that the movement can exert a strong enough stimulation for workers to decide to block their company from the inside, based on concrete demands. The national trade union leadership would then be sent back to the trash cans of history, and a new historical sequence could finally open. Which would imply that everyone takes sides. 1. The movement of goods is not limited to the transport and distribution of goods: goods begin to circulate in commodity exchanges, for example, while they have not yet moved. Conversely, raw materials sold to an industrial company for processing are thus valued, having been purchased, and they will enter into the determination of the value of the finished product: here circulation is prior to production. 3. It was Michel Jobert, then chief of staff of Prime Minister Georges Pompidou, who organised the operation – he publicly boasted about it twenty years later. 4. In Mexico, for example, the increase in the price of gasoline in January 2016 provoked a wave of massive demonstrations, often turning into rioting and looting, which certainly owed nothing to the neoliberal ideology! 5. Taxation and military conscription were the major reasons for sedition. The book by Boris Porchnev is in this respect edifying: Les soulèvements populaires en France de 1623 à 1648, Paris 1963, réed. Flammarion 1972. 6. However, we must relativise the impact of the blockages … if the trade of the city centers could be affected by the riots, which affected their sales, the effectiveness of the blockages is far from obvious. Supplies continued to be made, gas stations never ran out of fuel, supermarket shelves continued to fill up, and Christmas waste was given free rein, like other years. 7. The Constitution of the Fifth Republic grants to the President powers which he had never had under previous regimes, which were parliamentary, and in particular that of legislating by ordinances by dispensing with the National Assembly. We know that De Gaulle, who was of monarchist sensitivity, thought in 1958 to establish a constitutional monarchy. Which he did, in a way: a monarch, but who would be elected now. 8. At the height of the anti-monarchical revolts in the Occitan country, the rebels identified themselves as the commons, rather than as the people. The commons is precisely the political concept that corresponds to a becoming revolutionary of struggles. 9. The notion of a “moral economy” that some have evoked with regards to the GJ does not seem to us relevant in this case – if only because EP Thompson formulated it about an English working class which disappeared in the meantime, without talking about the “common decency” dear to George Orwell. Admittedly, there is still a morality of work shared in popular circles where, failing to enrich oneself by working more, number, one hopes at least to attain a degree of security, relative ease and, at the very least, a vague sense of personal dignity. In this respect Sarkozy’s “Working more to earn more” could find an echo among these people. They are now saying that none of this is guaranteed – not even a well-deserved retirement after a busy life. The Macronie is the thought of managers applied to the whole society without political mediation. Capitalism in its essential brutality. 10. “Yellow vests: can the middle class be revolutionary? LundiMatin, December 7, 2018. 11. We saw in the case of Notre-Dame-des-landes the use that was made of this little institutional thing that is the referendum – and Macron was a minister in the government that tried to use this arrogant coup … We can see now its confusing use in the hands of demagogues like Etienne Chouard.